Note that the speed at which a particular temperature travels along a bar when one end is heated is essentially the speed of the 'temperature waves'. This involves specific heat capacity and density as well as conductivity. Strips of copper, brass, steel and aluminium mounted on a wooden ring. Gentle heating at the centre melts wax placed in the cups at the end of each strip. Rates of conductivity in the different metals can be compared. 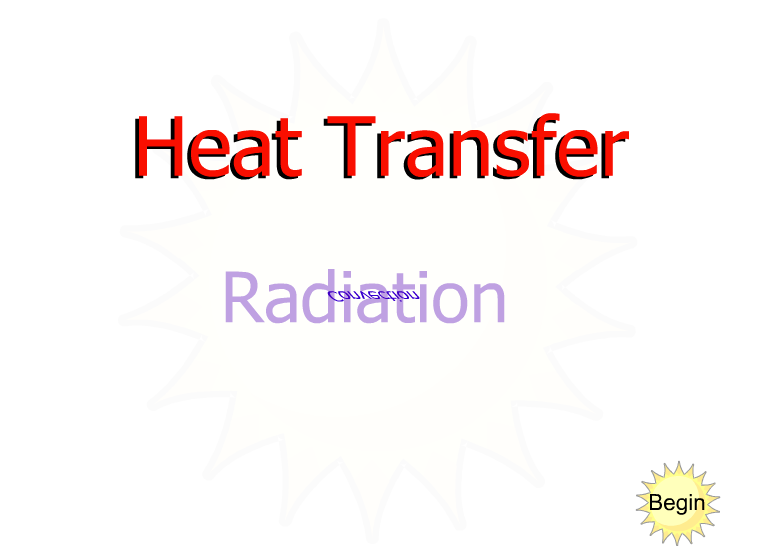 Convection is the transfer of heat by the actual movement of the warmed matter. Heat leaves the coffee cup as the currents of steam and air rise. 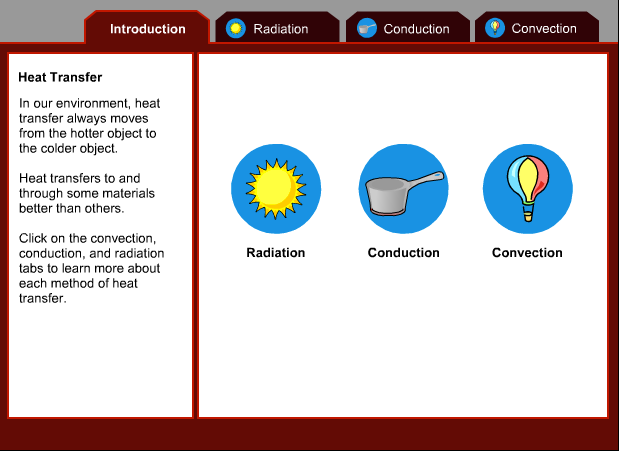 Convection is the transfer of heat energy in a gas or liquid by movement of currents. (It can also happen is some solids, like sand.) The heat moves with the fluid. Consider this: convection is responsible for making macaroni rise and fall in a pot of heated water. The warmer portions of the water are less dense and therefore, they rise. Meanwhile, the cooler portions of the water fall because they are denser. Fill the convection tube with cold water. Drop a single, very small, crystal of potassium manganate into the tube so that it falls to the bottom, leaving little colour. Heat it gently with a Bunsen flame at the bottom of the tube to see the streamers of dye begin to circulate. As soon as the tube is felt to be warmed by the hot water, stop heating. When a candle in a socket is placed under one chimney and a smouldering tape or touch paper is placed underneath the other chimney, the flow pattern of smoke dramatically illustrates the formation of convection currents. more vigorously creating more space between them. They spread out. More space between the molecules means bigger volume, the mass stays the same so it has less density which means that it floats up in surrounding cooler denser fluid. The cooler fluid then replaces the warm rising fluid and a current is set up. Radiation- Electromagnetic waves that directly transport ENERGY through space. Sunlight is a form of radiation that is radiated through space to our planet without the aid of fluids or solids. The energy travels through nothingness! Just think of it! The sun transfers heat through 93 million miles of space. Because there are no solids (like a huge spoon) touching the sun and our planet, conduction is not responsible for bringing heat to Earth. Since there are no fluids (like air and water) in space, convection is not responsible for transferring the heat. Thus, radiation brings heat to our planet. Place two flasks directly underneath two 100W bulbs. Each flask should contain a stopper with thermometer, as shown. The bottom of one flask is left untreated, the bottom of the other one is painted black. How a radiometer works: You need to focus on the edges of the vanes to explain the behavior of the radiometer. Heat excites the black surface of the vanes more than it heats the white surface. Black is a good absorber and a good radiator. Think of black as a large doorway that allows heat to pass through easily. In contrast, white is a poor absorber and a poor radiator of energy. White is like a small doorway and will not allow heat to pass easily.